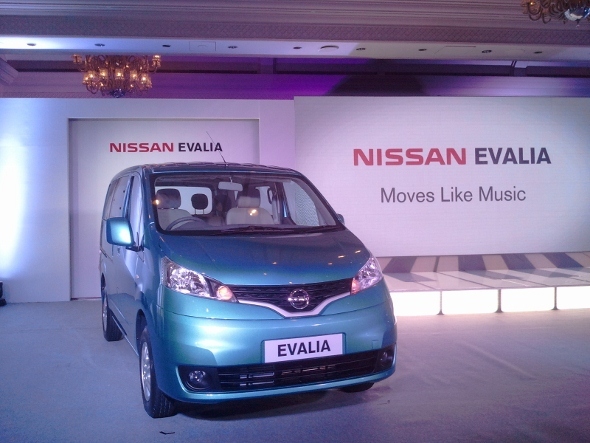 The Nissan Evalia will compete with vehicles like the Mahindra Xylo, Toyota Innova and Maruti Ertiga, catering to buyers looking for space, comfort and fuel efficiency. The Nissan Evalia has a classic van-like look, even though the front is quite aggressive, with upswept headlamps and bold grille. But from the sides and the rear it looks flat and boxy – typically van-like. This, however, is a practical design as it frees up plenty of interior space for its occupants. Fit and finish is good. On the interiors, the plastics used are slightly hard, but look durable. The Evalia features large sliding rear doors that make getting in and out of the vehicle easy. The third row is also quite comfortable with reclining seats that can be folded away to free up plenty of cargo space. Even with all rows in use, there is space for luggage. The Evalia XV has some features that make it quite unique. The keyless entry and start system is one of them. The ignition key is just a knob that needs to be turned after pressing the brake pedal to unlock the steering. The vehicle has a rear-view camera that has a display in the dash for easy reversing. All variants of the Evalia feature ABS and EBD, while the XEPlus, XL and XV variants get dual airbags as well. However, the vehicle lacks some basic functionality which may not go down well with many buyers, such as the lack of AC vents for the middle row, only a single cabin light, no day-night rear view mirror, and most of all – the middle row windows cannot be rolled down or slid open. The middle row windows are of the “butterfly” type that just pop open about 2 cm for ventilation and are practically useless in Indian conditions. The Evalia comes with Nissan’s tried and tested K9K 1.5 litre diesel engine that puts out 84 bhp of power and 200 Nm of torque. This is mated to a 5-speed manual transmission. The engine is quite fuel efficient with a claimed mileage of 19.3 kmpl, and during our test we got about 11.5 kmpl. Also see: Nissan Evalia video review. So how does the Evalia fare against its competitors such as the Mahindra Xylo, Toyota Innova and Maruti Ertiga? For one, the Evalia is the most spacious among all the competitors. It also has perhaps the best ride quality among the three vehicles. In terms of fuel efficiency too, it competes neck and neck with the Ertiga, and is more fuel efficient than the Xylo and Innova. In terms of price, the Evalia is competitively priced, with the top-end Evalia being about Rs. 50,000 cheaper than the top-end Mahindra Xylo. There is a Rs. 2 lakh price difference variant for variant compared with the Toyota Innova as well. Only the Maruti Ertiga is cheaper – the top-end Ertiga is the same price as the base Nissan Evalia. The Nissan Evalia is a product that draws mixed reactions. Buyers who want the sheer practicality and space of a large van-like people mover will definitely look at the Evalia. However, some things like non-opening middle row windows, lack of AC vents for the centre row etc, could be deal breakers for many buyers. Nissan, though, is quite optimistic and hopes to sell between 2000-2500 units a month. The bulk of customers, we think, will be fleet operators and hotels, while only about 25% of sales would probably be private buyers. We’d love to be proved wrong.